Business Card Magnets - Why dole out business cards that will be stuck in a wallet, forgotten, or tossed into the trash? Make your business memorable with high quality custom business card magnets that will cement your business, brand or message with every card that you hand out. Earn prime real estate on the refrigerator doors of every future client or prospect with business cards that will make your name and number easy to find, store, and display on any magnetic surface. Plus, buy magnets and enjoy free custom designed artwork, full color printing, online proofs and setup with every order! Shapes - Think outside of the square box with custom shaped magnetic reminders that will suit your shop or business to a tee. From circles and stars to animals, vehicle and food shapes, you'll find the perfect silhouette or form to push your message and your sales forward, featuring hundreds of unique, fun and compelling shapes to choose from. Can't find the ideal shape to fit your exact needs? 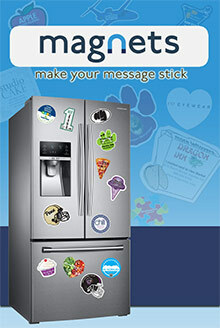 You'll have access to an expert team of graphic artists who will design your own custom die cut refrigerator magnets to match your specific logo, image, and just about any other shape you can dream up. The sky's the limit! Shop by Industry - Whether you deliver pizzas or care for pets, run a restaurant or a real estate office, you'll discover a specific selection of marketing tools that will help you get your establishment noticed and remembered. No matter what your line of work is, you can buy magnets with pre-designed templates that will work for you, with hundreds of custom industry magnet designs displayed in their Design Gallery, ready to be ordered and fully personalized, without costing you a penny. Popular Products - Browse the most popular and bestselling styles available that are guaranteed to give your business or event a boost. From business cards to calendar magnets, sport schedules to wedding save the dates, you'll find promotional solutions that will stick indoors and outdoors, on cars, on door handles, in mailing campaigns, and even more lucrative advertising opportunities. Shop by shape or by size, from mini 2x2 to mega 6x8 sizes, and enjoy a super quick turnaround, with next day ship options available. Since 1997, Magnets.com has cornered the market on custom promotional magnets, offering free design and artwork, full color printing, set up, proofs, and the best prices on the market with no hidden fees, ever.